bDepartment of Diagnostic Radiology (M.M.-B. ), Section of Neuroradiology, University of Washington, Seattle, Washington. SUMMARY: Reversible cerebral vasoconstriction syndrome is a clinical and radiologic syndrome that represents a common presentation of a diverse group of disorders. The syndrome is characterized by thunderclap headache and reversible vasoconstriction of cerebral arteries, which can either be spontaneous or related to an exogenous trigger. The pathophysiology of reversible cerebral vasoconstriction syndrome is unknown, though alterations in cerebral vascular tone are thought to be a key underlying mechanism. The syndrome typically follows a benign course; however, reversible cerebral vasoconstriction syndrome may result in permanent disability or death in a small minority of patients secondary to complications such as ischemic stroke or intracranial hemorrhage. Timely and accurate diagnosis of RCVS is essential to ensuring appropriate patient care and avoiding unnecessary diagnostic tests. However, the diagnosis can be challenging because its signs and symptoms can overlap those of better known disorders of the central nervous system, including aneurysmal subarachnoid hemorrhage and primary angiitis of the CNS.1,2,6,12⇓–14 Furthermore, a key feature of RCVS, segmental arterial vasoconstriction, may be absent early in the course of the disease.1,2,4,5,14 Consequently, both the clinician and radiologist must maintain a high level of suspicion for this entity in patients presenting with characteristic features. The first part of this article will review the history of RCVS, including the previously described clinical entities that it is now thought to include. We will then discuss the epidemiology, diagnostic criteria, and clinical presentations of this disorder and explore the association of RCVS with posterior reversible encephalopathy syndrome (PRES). In the second part, we will review the imaging features of RCVS, including more recent work exploring associated imaging changes in the cerebral arterial vasculature beyond segmental vasoconstriction. Reversible segmental cerebral vasoconstriction has been described in the medical literature in a diverse array of clinical settings dating back to the 1960s.15⇓–17 The earliest clinical reports associated this finding with the postpartum state, migraine headaches, unruptured cerebral aneurysms, and the use of vasoactive medication such as ergot derivatives. Initially, patients presenting with cerebral vasoconstriction were thought to have unique disease entities, depending on the given clinical scenario and specialist treating the patient (Table 1).4⇓–6,8⇓⇓–11 The common features of these cases, including clinical presentation with severe headache, reversibility of angiographic findings, and lack of histologic abnormalities on arterial biopsy, were not well appreciated or understood. In 1988, Gregory Call and Marie Fleming described a unique clinical and radiographic syndrome in a small case series of 4 patients presenting with acute headache and reversible cerebral artery vasoconstriction.18 When the authors included 12 previously published case reports of patients presenting with similar findings, comprising some associated with migraines and postpartum state, they noted distinctive features of the syndrome, such as its association with hyperacute headache, transient or permanent neurologic deficits, normal or nonspecific findings on CSF analysis, and the lack of correlation between the resolution of patient symptoms and arterial vasoconstriction. In this small series, the authors demonstrated a wide range of possible clinical outcomes, from complete resolution of symptoms to permanent disability with hemiparesis and/or cortical blindness. The eponym “Call-Fleming syndrome” was subsequently used to describe the entity. The key diagnostic criteria for RCVS proposed by Calabrese et al6 have since been slightly modified by the International Headache Society (Table 2). Although these criteria have not been validated in any prospective study, they have proved very useful clinically to diagnose RCVS and to increase physician awareness of the disease. RCVS commonly affects patients 20–50 years of age (mean, 42–45 years), though other age groups, including children and adolescents, can be affected.1,2,5,6,17,23⇓⇓⇓–27 Most interesting, the mean age of men presenting with RCVS tends to be a decade younger than that of female patients (fourth decade).9,12 There is a female predominance, with an average female/male ratio from 3 large series of patients of approximately 2.4:1.2,5,9,17,23,24 RCVS does not appear to be limited to any single ethnic or racial group.19 As Ducros19 highlighted in her review of RCVS, differences in patient characteristics in large published series could reflect either intrinsic differences in RCVS among various patient populations and/or differences in patient recruitment criteria. The pathophysiology of RCVS remains unknown. However, alterations in cerebral vascular tone leading to vasoconstriction are thought to be a key pathophysiologic mechanism underlying the development of RCVS.1,2,6,9,23,43 This hypothesis is supported by the lack of histologic changes noted in and around the cerebral vasculature in patients with RCVS who have undergone brain biopsy.1,43 Specifically, histologic and electron-microscopic analyses have failed to demonstrate evidence of active inflammation or vasculitis.1 Deregulation of cerebral vascular tone in RCVS may be induced by sympathetic overactivity, endothelial dysfunction, and oxidative stress.3,5,11,12,23,48,49 The association of RCVS with blood pressure surges, ingestion of sympathomimetic vasoactive substances, and pheochromocytoma support the role of sympathetic overactivity in its pathogenesis. On the other hand, a significant overlap between RCVS and PRES supports the importance of endothelial dysfunction, which is known to play an important pathophysiologic role in the latter. Because RCVS likely represents a common end point of a diverse group of disease processes, it is possible that the contribution of sympathetic overactivity and endothelial dysfunction to the onset of the syndrome varies depending on the incitant event in a given patient. Genetic factors may influence an individual's susceptibility to developing RCVS and the severity of its subsequent clinical course. A specific genetic polymorphism (Val66Met) in the gene for brain-derived neurotrophic factor, which is important for neuronal survival, neurogenesis, and synaptic plasticity, has been associated with more severe vasoconstriction in patients with RCVS.50 Most interesting, brain-derived neurotrophic factor can also affect vascular function and has been associated with disorders of abnormal vascular tone and unstable angina. A 47-year-old woman with the sudden onset of severe headache. Initial noncontrast head CT (A) demonstrates trace sulcal subarachnoid hemorrhage (white arrow) near the vertex. CT angiography performed at the same time (B) is interpreted as having unremarkable findings. 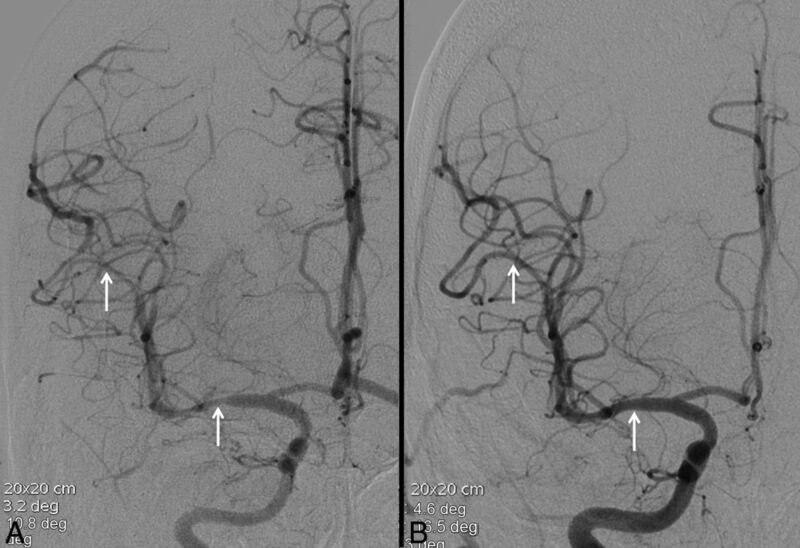 Conventional angiography (C) demonstrates mild diffuse irregularity with multifocal narrowings throughout the cerebral vasculature with a beaded appearance, most pronounced in distal right middle cerebral artery cortical branches (black arrow). Findings are most consistent with RCVS. Follow-up catheter angiogram performed 1 month later (D) demonstrates complete resolution of cerebral vasoconstriction (black arrow). Thunderclap headache is not specific for RCVS and can be associated with various other medical conditions, including aneurysmal subarachnoid hemorrhage, primary headache disorder, pituitary apoplexy, cerebral venous sinus thrombosis, unruptured cerebral aneurysm, cervical arterial dissection, and third ventricle colloid cyst, among others.53 In fact, prior reports suggest that RCVS will ultimately be diagnosed in less than half (45%) of patients presenting with a thunderclap headache.14,51 For example, Grooters et al14 found that only 8.8% of patients presenting to a single center with thunderclap headache and no evidence of aneurysmal subarachnoid hemorrhage were ultimately diagnosed with RCVS. A 42-year-old woman who presented with altered mental status and lethargy. FLAIR imaging (A) demonstrates signal hyperintensity involving the cortex and underlying subcortical white matter in the parietal and occipital lobes (white arrows), consistent with PRES. There is no evidence of associated diffusion restriction. Trace sulcal subarachnoid hemorrhage was also noted overlying the right frontal lobe (not shown). Note subtle irregularity and multifocal narrowings involving distal cortical branches of the bilateral middle and anterior cerebral arteries (black arrows) on cerebral angiography (B), suggestive of RCVS. The patient made a full recovery, with complete resolution of cerebral areas of abnormal FLAIR hyperintensity (C) and cerebral vasoconstriction (not shown). PRES-like reversible cerebral edema is encountered in anywhere from 9% to 38% of patients with RCVS, while most patients with PRES (>85%) demonstrate some element of RCVS-like cerebral vasoconstriction when conventional angiography is performed.19 When PRES-like features are encountered in cases of RCVS, the anatomic distribution of cerebral edema is similar to PRES encountered in other settings.44 Furthermore, PRES and RCVS often arise concurrently as complications of various medical conditions, including intravenous immunoglobin therapy, Guillain-Barre syndrome, immunosuppression, stem cell transplantation, blood transfusions, and septic shock.2,7,28,54,56,66,67 Finally, both PRES and RCVS demonstrate similar clinical features, including an acute, self-limited course and symptomatology, such as headache, confusion, seizure, and transient or permanent neurologic deficits.1,2,54 Given the significant overlap between the 2 entities, it is possible that RCVS and PRES may represent a spectrum of potential clinical manifestations of a common underlying pathophysiology involving various degrees of altered cerebral vascular tone and endothelial dysfunction. A 19-year-old man with a 2-day history of recurrent headaches and prior marijuana use. Noncontrast CT was negative for acute hemorrhage (not shown). 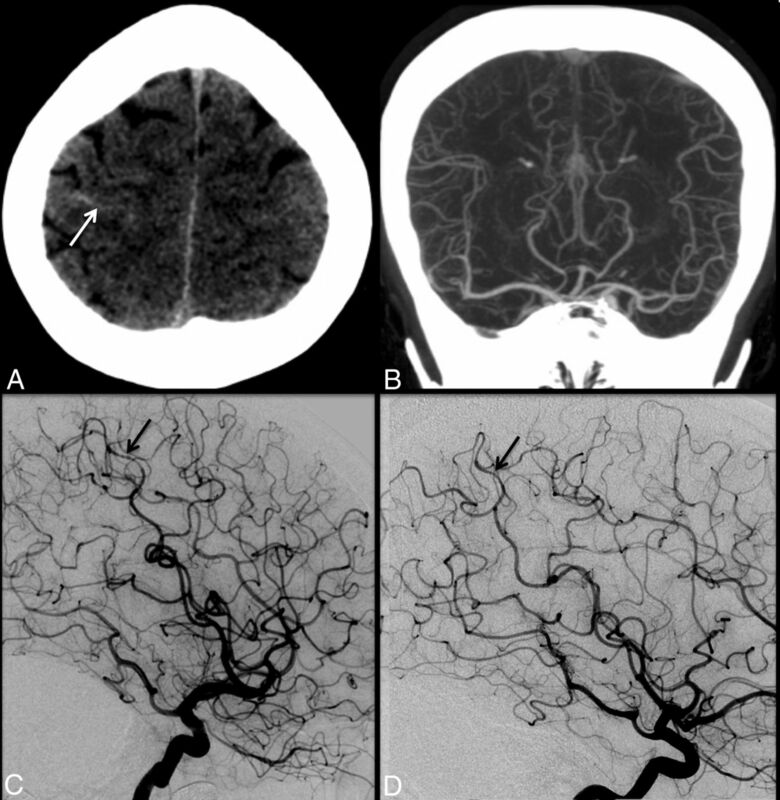 Conventional angiography (A) reveals multifocal areas of moderate narrowing and irregularity involving the cerebral vasculature (white arrows, A). These areas resolved following intra-arterial administration of verapamil (white arrows, B). Clinical course and imaging findings are consistent with RCVS. RCVS is characterized by a thunderclap headache and reversible cerebral artery vasoconstriction on imaging. Alterations in cerebral vascular tone likely underlie development of the syndrome. Most patients with RCVS have a good outcome with no permanent sequelae, while a small minority will experience a more fulminant course culminating in permanent disability or death. Regarding "Cerebral Angiography for Evaluation of Patients with CT Angiogram-Negative Subarachnoid Hemorrhage: An 11-Year Experience"